Although they happen every day, nobody is ready to be involved in a car accident. Car accidents can result in damages to your vehicle, injuries that you or passengers sustain as a result of the collision, and an intense insurance claims process. However, even after your vehicle is repaired, the damages suffered to you person can last years. This means that a car accident can take a substantial emotional and financial toll on your life and the lives of those you travel with. If you have been involved in a car accident, it is in your best interests to consult a Miami car accident lawyer, who will assist you every step of the way. If you have been involved in a car accident, there are a series of steps you should follow to ensure your safety, shield yourself from liability, and best support your claim for recovery. Remain Calm: Adrenaline and tempers may be high. Staying calm is the best way to ensure a more positive outcome. Florida requires that a Traffic Report must be completed if the accident results in at least $500.00 of property damage, injury, or death. Therefore, immediately call 911 to report the accident, and inform the operator of any injuries suffered. Move your Vehicle: Although you have just been involved in an accident, your vehicle may still endanger other motorists, and other motorists may still pose a danger to you. If possible, move your vehicle to a safe location (e.g. on the far shoulder), where you and the other parties involved in the accident may exchange information. Avoid injury/Avoid Altercation: Make sure your car is off, check on the severity of any injuries, and remove yourself from the zone of danger. Also, as mentioned, tempers may be high, so please avoid arguing with the other driver about fault, and be fully cooperative with police. Exchange Information: When exchanging information with the other driver(s), make sure to obtain 1) insurance details, 2) driver's license number, and 3) vehicle registration. Secure Witnesses: If possible obtain the names, addresses, and phone numbers of as many witnesses as are willing to provide them. Obtain Medical Attention: The full trauma of an accident is not felt for few days. Therefore it is important to seek medical treatment as soon as possible after the accident, even if you may believe your injuries to be minor. This way, you'll have a medical report for the insurance company if they determine it to be necessary. Obtain Pictures of the Scene: Although it is advisable to keep a disposable camera in your car for emergency situations like this, you could have someone bring one to the scene, or use your cell phone. Photographs can prove to be convincing evidence at trial, especially when fault is at issue. Do Not Give a Statement to Other Driver's Insurance Company: You have no duty to provide ANY kind of statement to the other driver's insurance company. 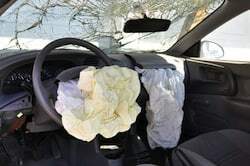 Therefore, you should refuse to make comments of any kind about the accident, and should contact our firm before making a statement to your own insurance company as well.